One Couple. Two Weddings. Forty Years. An Eternal Bond. This week’s Torah portion, Vayeitzei, is replete with weddings, births and the subtlety of complex family dynamics. 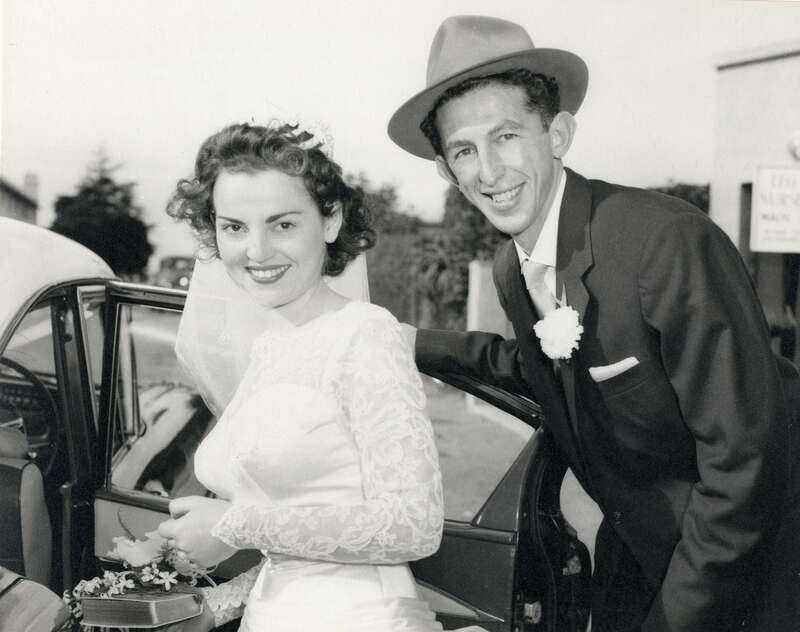 In that spirit, here is the story of a remarkable woman’s (first and second) wedding. August 1998 – that meant Maurice and I would be married for forty years. Forty years of love, life and laughter, four wonderful children, three wonderful grandchildren and one on the way. No reason to be discontented. But there was something that bothered me, especially since my daughters had become Lubavitchers. Maurice and I had been married in a Reform temple. I wanted to be remarried in a religious ceremony and have a kosher ketuba (marriage contract.) I wanted to be married under the stars, under a tallis with Rabbi Wineberg (the local Lubavitch Rabbi in Johannesburg, South Africa) officiating. So that’s how it all happened. I thought that “getting married” again just meant the chuppa and a party. But Rabbi Wineberg and my daughter Neria had other plans. Mikva! I balked!! I told Neria not to push me – I’d think about it. The idea didn’t excite me in the least. In fact, I felt quite aggressive about it. I know many will laugh and even sneer at what I am about to write, but on numerous occasions in my life on really important and even not so important matters, I hear the Rebbe’s voice. It happens in the early hours of the morning (I go to sleep very late). He repeats his message. This time, the words were plain and simple: Mikva-Mikva-Mikva. Phone calls were made and on the appointed Sunday, I, a sixty year old kalla (bride), found myself entering an absolutely beautiful mikva in a nearby suburb. I was attended by an extremely kind and gentle lady; she made me feel like a young bride as she guided me through all the preparations. The prayer she gave me to say was so beautiful I wanted to read it over and over again. Now for the “big guns” – the immersion. The pool room had a certain holiness about it, something not quite tangible. I found myself feeling really excited and nearly fell in!! What followed was quite wonderful though it had its moments of humor. I’m quite slim and lightweight and kept bobbing around and knocking into the sides. Eventually, I got into the rhythm and managed to touch the bottom. I left the mikva building after about an hour, my face void of its usual make-up, my hair just hanging. Never in my entire life had I felt more beautiful, more spiritual and more worthwhile. I walked back to my car but my feet didn’t touch the ground. I heard the birds twittering in the trees, yet I felt as if my entire body was in a vacuum. I sat in my car for about half an hour reliving the past hour. I was filled with the urge to be better. Inwardly I felt so peaceful yet excited. I said a private “thank-you” to the people who had urged me to “do” mikva – particularly to my daughter, Neria, whose quiet insistence could straighten the tower of Pisa or even cause the Rock of Gibraltar to tremble!! That afternoon, a bewildered Maurice found himself whisked off to the men’s mikva by his son-in-law. Golf in the morning, mikva in the afternoon and getting married at night. That’s what is called living in the fast lane. This time the tears were tears of joy. At sunset in the Torah Academy courtyard, under a tallis, with Rabbi Wineberg officiating, surrounded by close friends and relatives, attended by my beautiful daughters and baby grandson, a sixty year old kalla circled the love of her life. No bride half my age could have felt younger or more joyous. Maurice broke the glass with all the vigor of forty years ago. Mazaltov! Mazaltov! The local kosher restaurant did us proud. The tables groaned with delicious food, beautiful flowers and the wine and Black Label flowed freely. What a simcha! What a wedding! To health! To Life! LeChaim! I have known Jeanette all my life. She made a deep and unique impression on me both through her own remarkable light and through her equally remarkable children. Below is an Instagram post inspired by her. May her memory be a blessing.